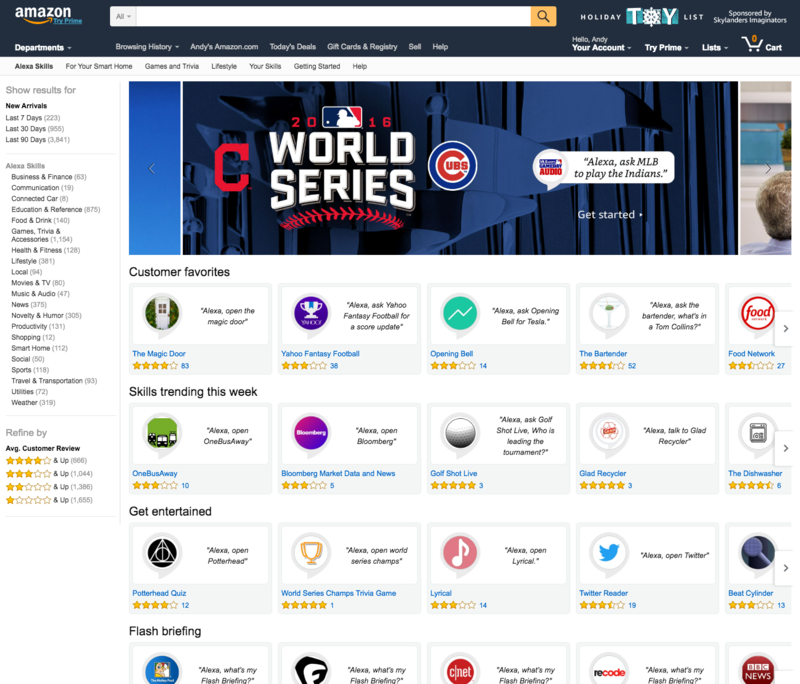 Today, we unveiled a new way for customers to browse the breadth of the Alexa skills catalog and discover new Alexa skills on Amazon.com. See the experience. Now every Alexa skill will have an Amazon.com detail page. 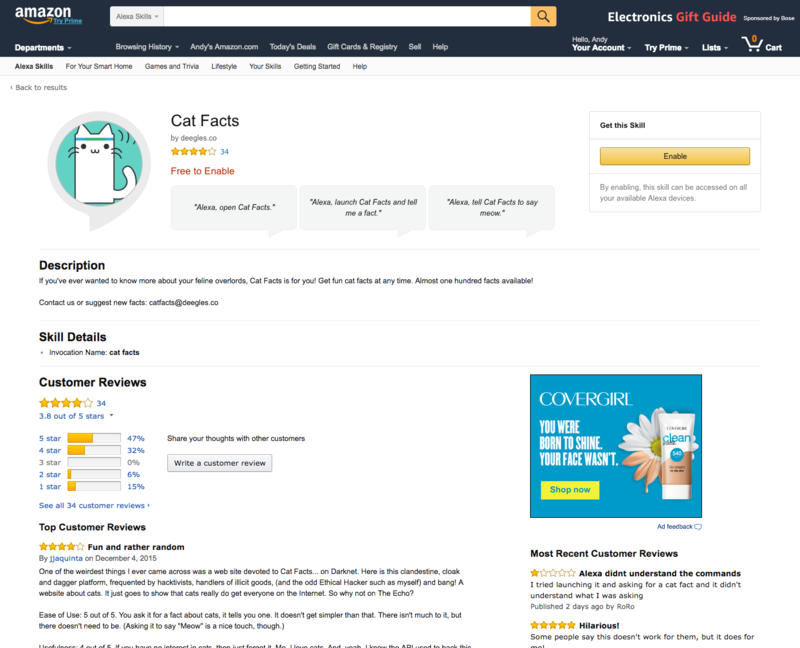 On-Amazon detail pages improves discovery so that a customer can quickly find skills on Amazon and enables developers to link customers directly to their skill with a single click. This is the first time that we are offering a pre-login discovery experience for Alexa skills. Before now, customers would need to log in to the Alexa app on their mobile device or browser. Developers can also improve organic discovery by search engines by optimizing skill detail pages. You can now link directly to your skill’s page on Amazon.com. On the page, customers can take actions, like enable and disable the skill and link their accounts. For the first time, you can drive customers directly to your skill detail page to increase discovery and engagement for your own skill. To link directly to your skill, simply navigate to your skill’s page and grab the URL from your browser. Alexa, Amazon’s cloud-based voice service, powers voice experiences on millions of devices, including Amazon Echo and Echo Dot, Amazon Tap, Amazon Fire TV devices, and devices like Nucleus that use the Alexa Voice Service. Over a year ago, Amazon opened up Alexa to developers, enabling you to build Alexa skills with the Alexa Skills Kit and integrate Alexa into your own products with the Alexa Voice Service. Today, tens of thousands of developers are building skills for Alexa, and there are over 3,000 skills on Alexa. Our skill templates and step-by-step guides are a valuable way to quickly learn the end-to-end process for building and publishing an Alexa skill. You can get started quickly using the flash cards skill template, fact skill template, trivia skill template, or how to skill template. Plus, if you publish a skill, you’ll receive an Alexa dev t-shirt. Quantities are limited. See Terms and Conditions.